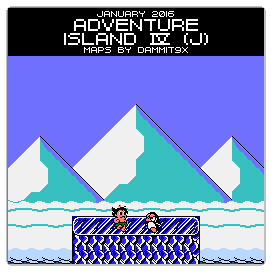 For this month's "Maps Of The Month" featurette, I wish to draw your attention to Dammit 9x's Adventure Island IV (J) (NES) maps. Tired of the cold weather? Why not take a trip to a nice tropical climate, like the settings of the Adventure Island games? How about Adventure Island IV (J)? Well, it would be a nice time if only the evil Eggplant Wizard (probably no relation to the ones from Kid Icarus) hadn't kidnapped Master Higgins's girlfriend Tina and all their dinosaur friends. Adventure Island IV (J), or "Takahashi Meijin no Bouken Jima IV (J)", if you prefer, is the fourth game in the classic Adventure Island game series. What makes it different is that it is not linear like the previous games, instead requiring "retraversal", i.e. revisiting areas with new abilities to access new areas. And that's why, more than any game in the series (except Super Adventure Island II, which is also not-so-linear) you will really need Dammit 9x's maps. Perhaps this is borrowing a page from the later Wonder Boy/Monster World games (like how the first Adventure Island game was an adaptation of the original Wonder Boy), or the many other now-more complex platformers that have already long been out on the NES, like Blaster Master or Ufouria (E). The fourth Adventure Island was released for the Famicom in 1994, even Super Metroid had already been released in the West by then. (Is it just me, or does the boss of Area 1B look kind of like the Metroid series's Chozo statues, complete with a ball?) In fact, this game is so late, it is actually the last Famicom game released! So to recognize the effort put into mapping the final official Famicom game, Dammit 9x's Adventure Island IV (J) (NES) maps will be known as VGMaps.com's Maps Of The Month for January 2016. Yes I have played AI II. The first of the New Year Game of the month! Almost we will have the complete Adventure Island map collection. Evidently this Mr Higgins caught on after the break-off from Sega as Wonderboy. Both series are pretty popular with several games available. BUT now the Monster Boy and the Cursed Kingdom! These maps always come in handy and we appreciate the contributes! There was a lot of games not translated for English speaking folk. Luckily we have some fan translators in our midst. At any rate, thanks for the maps Dammit!